I hope you had a great Father’s Day weekend. 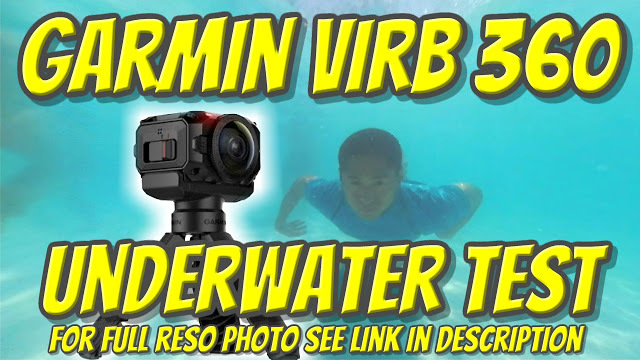 Over the weekend, I tested the Garmin Virb 360’s underwater capabilities in a swimming pool. Here are videos and photos. The Garmin Virb 360 is waterproof up to 10 meters, without needing a housing. The Virb is only the second 360 camera for consumers to do that (the first was the Nikon Keymission 360). Of course, just because a camera is waterproof does not negate the laws of physics. In particular, refraction will often be an issue. That is why in my list of 12 things to know about the Virb before ordering, I warned that Garmin had not posted any underwater photos or videos, and that there would likely be refraction underwater. In the case of the Virb, as long as the camera is vertical and nothing is passing over the stitch line, it looks smooth. If the camera is vertical, the stitching looks weird. And obviously if anything passes over the stitch line it will look split because of refraction. Without an underwater housing with spherical lenses, I think this is as good as it gets.